I’m really sorry I didn’t blog yesterday but I had lots of homework! Yuk…… Next week I’m going to our local Clandestine Cake Club meeting. It’s a great way to share your cakes and meet other people who like to bake, there is probably a club near you so do look at their website (www.clandestinecakeclub). The theme for our meeting is spectacular so my bake this week is a spectacular cake. Pop back on Tuesday to see what I end up baking. Well I’m back……….. It’s been a hard bake this week as I was trying to bake Mary & Paul’s chocolate creation show stopper for our Clandestine Cake Club meet up tonight. Mary & Paul’s cake is a three tiered caked but after three attempts (thats nine cakes) I had to give up. I think I tried something that was a bit toooo advanced for me. 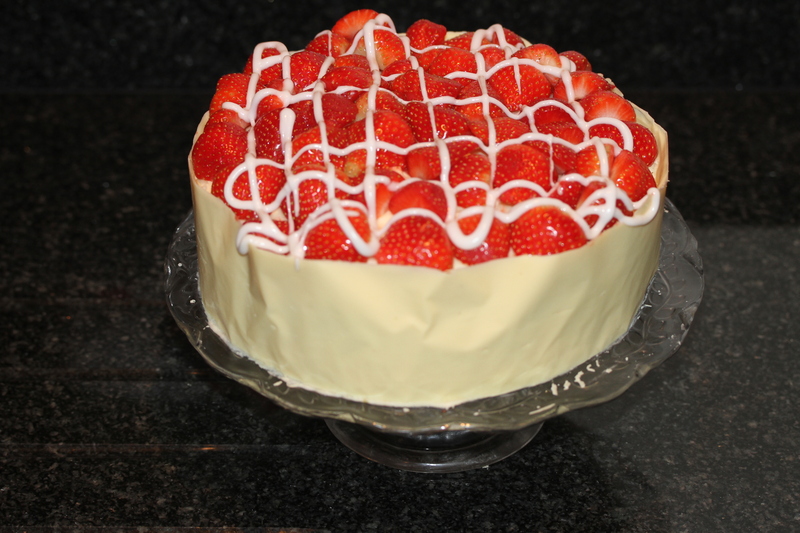 So I ended up making a creation of my own which was my victoria sponge covered in a lemon butter icing with a white chocolate collar and topped off with strawberries. I had a great time at the Clandestine Cake Club and perhaps ate toooo much! I’ll be back tomorrow with my bake for the week. See you tomorrow.